Ensemble Theatre presents, SORTING OUT RACHEL, by David Williamson, at the Ensemble Theatre, Kirribilli. 19 January - 17 March. SORTING OUT RACHEL, at the Ensemble Theatre, is the latest annual play and production from Australian playwright, David Williamson. We meet Bruce (John Howard), a self-confessed unscrupulous businessman - his latest foray is in the Aged Care sector, where money making rather than actual care is of the highest priority - and finds himself, boastfully, a $60 million dollar man. His wife Molly has recently passed away. The play begins in an outdoor restaurant location where Bruce is meeting his illegitimate daughter, Tess (Chenoa Deemal), whose mother was aboriginal and the trusted domestic employee of Molly. The identity of Tess is a secret - no-one knows of her existence, except her mother's 'mob' - though Bruce has supported both mother and daughter through 'gifts' of money, over the years. Tess is a feisty young woman in the early study of Medicine. She has decided to claim some of Bruce's wealth and is prepared to blackmail him into setting up a Trust to support an Indigenous Health Training Plan, or, else, she will make a public litigious claim for half the $60 million and contest the will. Part of her plan is motivated by her envy over the contrasting treatment of Bruce's 'legitimate' daughter, Julie. Julie (Natalie Saleeba), an unhappy, superficially-engaged thinker of modern psychology, a spoilt acceptor of unearned money and advantage (it is, for her, a kind of unconscious entitlement) is struggling with her lack of confidence around the upbringing of her daughter, Rachel. She is married to Craig (Glenn Hazeldine), who as a manager of a Club has manipulated the books to expose himself to embezzlement accusations - which he justifies by saying that all managers do it! - in the addictive nature of creating the appearance of a successful career by having the money to be able to endow himself with the materialistic code-markers: luxurious house, car, private school for his child, golf club membership, etc - to symbolise his success. Affluenza at its most desperate end! He certainly wants to live in Bellevue Hills not Haberfield, and to drive a Mercedes, at least. He has no qualms about using his father-in-law to fulfil his fantastic destiny, even if he misrepresents the supposed aspirations of his wife, Bruce's daughter, to do so. At the end of this genetic chain we meet final year high-schooler, Rachel (Jenna Owen), who has all the negative attributes of an indulged twenty-first century child with all the gadgetry of the internet and iPhone to indulge, petulantly, any desire she wishes to fulfil. Rachel has no conscience or sense of consequence at all, so long as it serves her needs - her treatment of family and friends is appalling. But, then she has no role models for ethical practice and her being as morally de-formed as her pro-genitors cannot be, for a discerning audience, a surprise. This play is about the ruthless pursuit of mammon at the expense of all other social and personal virtues and the consequent corruption to the ideals we have thought the best of human endeavour. The play is called SORTING OUT RACHEL - and she is sorted out in an unbelievable denouement in the writing - but it could be called SORTING OUT A MODERN FAMILY. A more unpleasant group of people, representing a 'family', the supposed corner-stone of our society/community structure, could not be found. Mr Williamson has his usual satiric eye gazing (glazing) over elements of Australian (Sydney?) life in 2018 with a callous thrust but whilst doing so also pursues his usual penchant for topical press-button issues - that allows us to feel included in the reality of the time of the play, though they are only lightly alluded too - with easy sentimental comedy that is 'topped' with the need to have a happy-ending. Mr Williamson does not have the courage of an Ayckbourn (e.g. A SMALL FAMILY BUSINESS - 1987) to let the 'rot' stink. SORTING OUT RACHEL is a fairly unsatisfactory experience in the theatre. The production of the play, Directed by Nadia Tess, is not assisted by the casting of the actors. The best of them, John Howard, shambles his way, in his inimitable laconic habit, through Bruce's responsibilities with a quasi-improvisationary calm - steadiness - navigating his actor's sensibilities as best he can with Williamson's Bruce, a 'difficult', unlikable hero - anti-hero - who is at the centre and occupys a lot of the action of the play. Too, Glenn Hazeldine has the experience to bring some credibility to his man, Craig, who, in the writing, is such an unlikable 'weasel' specimen of a man, that he is easily dispensable to our empathetic concerns - he nearly gets away with it. Though, not quite. Natalie Saleeba, begins rather shakily, -'stagey' - as Julie in her scenes with Craig but gradually grows in confidence, especially in the second half, as her character finds her power/her mojo with Rachel and her husband. Chenoa Deemal, as the 'hidden' daughter, Tess, has a role that is rather like a set of book-ends. Mr Williamson has her set up a strong premise for a play, - front book-end - but then has her disappear, little referred to in the action of the unfolding drama, until almost the end of the second act, where dramaturgically, Tess is used to resolve the moral dilemmas of all we have watched, in a fairly perfunctory, and unsatisfactory way, for, even she is an ethically suspect individual - the back book-end - for the conclusion of it all. Jenna Owen, making her stage debut in this production and playing the titular role, Rachel, comes from a television and sketch comedy background that does not seem to have prepared her for the task asked of her on the Ensemble stage. Her Rachel is mostly one dimensional, shouted and physically frozen. There is intelligence, an actor's instincts, but it seems to lack instrument flexibility to be able to utilise it as a tool to inform the audience of other dimensions to justify the actions of her responsibility, her young woman, Rachel. The worlds of television (PUBERTY BLUES) or film have technique substitutions to enhance a performance that theatre strips back conspicuously when it is seen as an unedited viewing, live. The audience see and devour every offer from head to toe. They hear and translate every vocal offer. There is no editor to tidy up the acting 'clues' given. 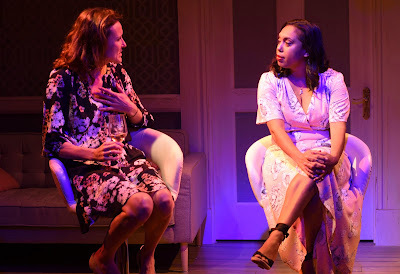 The Set Design, by Tobhiyah Stone, is simple in its solving of the many scenes and locations, with the employment of static imagery projected on the back walls/screen of the set. No doubt part of the influence of Ms Tass, best known, in Sydney, for her filmic achievements. The Costume is also an appreciable shaping of the social status of the world of the characters by Ms Stone. 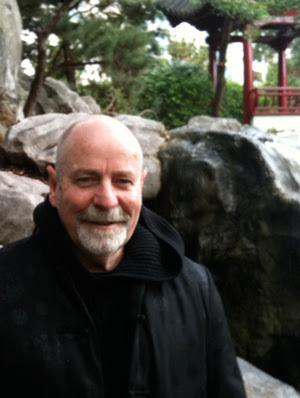 Christopher Page manages the Lighting with skill and sensitivity. This January, has had some encouraging new Australian writing: BURIED; TONSILS AND TWEEZERS; FAG/STAG, but SORTING OUT RACHEL, is not in that category, sad to say.